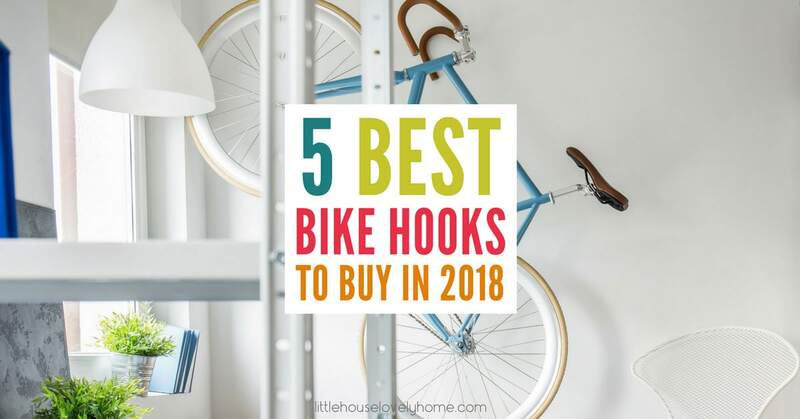 If you’re looking for a cheap indoor bike storage solution, bike hooks are the best choice for your budget. Whether you mount the bike hooks in your garage, shed or inside your home, make sure you fasten to a stud or ceiling rafter for extra support. The hooks below range from screw-in hooks under $10 to full garage storage solutions for slightly more money. No time? Just want the best option? 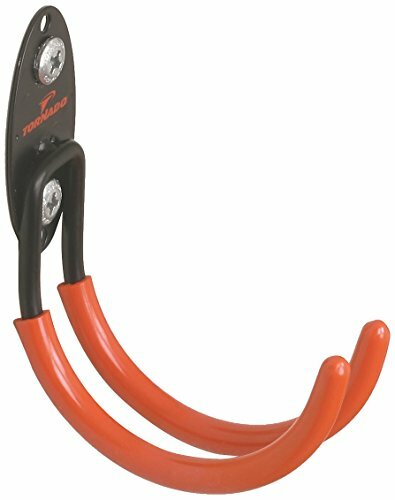 You can’t go past Impresa’s Heavy Duty Bike Hooks. They hold up to a whopping hundred pounds per hook and are versatile enough to be used on the ceiling or wall. Plus the price is excellent. Click here for more reviews and to check the price. If you have enough room, these indoor bike storage ideas might be better suited. 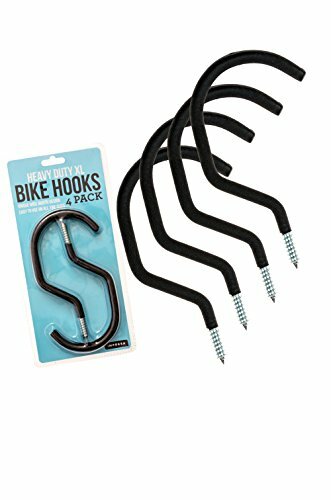 These bike hooks take top spot for versatility and price and strength – each hook can hold up to 100lbs!. They are equally effective when hanging a bike from a ceiling or wall. The wide-mouth design fits more tires than other hook designs, Heavy duty and with a long enough thread to allow for a half-inch of sheetrock on top of a stud. Make sure you mount these to a wall stud, or rafters. Manufacturer tip: Hang your bike vertically for the strongest hold. The Tornado Large J-Hook design does what it says on the tin. The spike on the back plate lets you find the right position on the wall before screwing the hook in. Tip: Some reviewers commented the provided screws were too short for drilling a pilot hole. If you intend to drill a pilot hole, grab a bag of extra long screws. 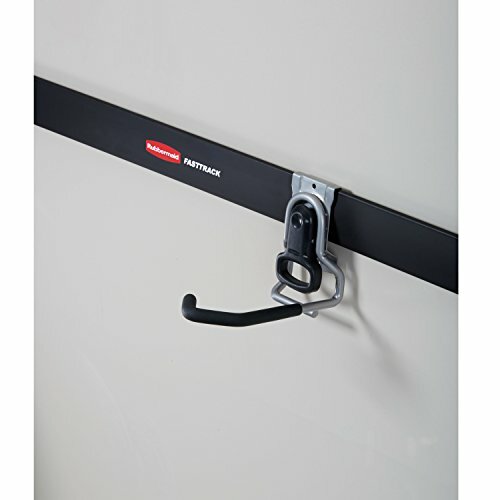 The Rubbermaid FastTrack Garage Storage System Vertical Bike Hook only works with the Rubbermaid FastTrack Garage Storage System Rail, but if you’re willing to invest a little more into an all-purpose garage storage solution this is a great product. The Rubbermaid FastTrack Garage Storage System claims to “create 10 times more storage space than screwing hooks into studs”. (Go here more garage storage inspiration). 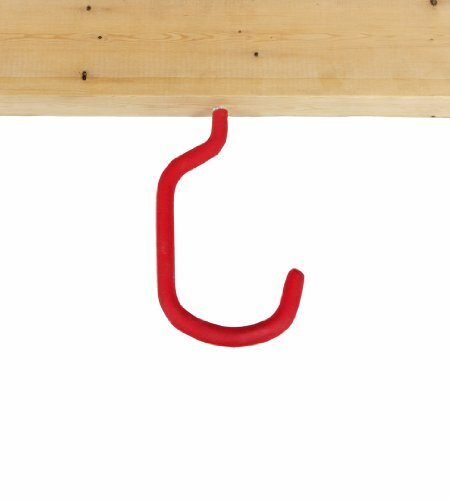 These heavy duty bike hooks by Tekton hold up to 50lbs per hook, so you can also store other equipment like ladders and garden tools. Or more bikes! Reviewers love how solid these hooks are. They definitely live up to their heavy-duty name. Plus, the ceiling mount helps keep your garage clutter-free. 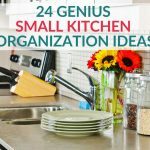 This slots into the Organized Living Activity Organizer Wire grid, or use the included hardware to mount the Organized Living Activity Organizer Loop Hook directly on the wall. Weight Limit: Holds up to 75lbs. 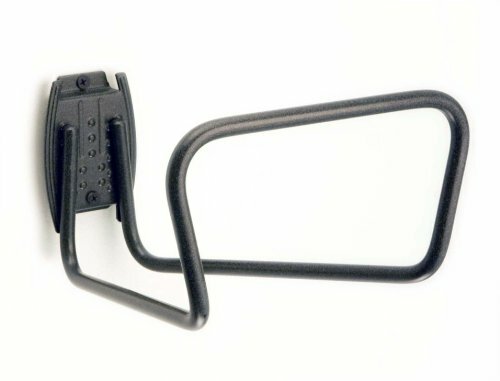 Bike Hooks are the ideal solution for cheap bike storage for your garage or other indoor space. 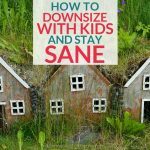 They keep the floor clutter-free and they don’t cost much at all. Looking for outdoor bike storage solutions? 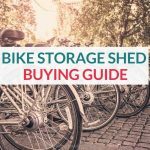 Check out my best bike storage sheds review or if you need a more flexible outdoor bike storage solution, this article on bike covers might help.